The future continues to appear rich in baseball talent for Boulder City High School. 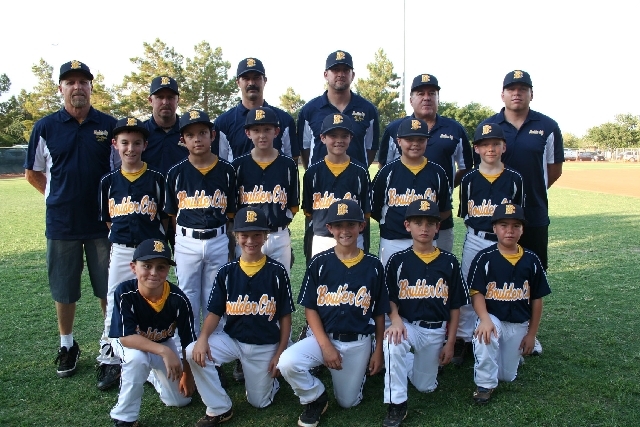 The Boulder City Little League All-Stars are the second youth group to do well this summer. The All-Stars, ages 9 and 10, compiled a 3-1 pool-play record and reached the semifinals of the Nevada District 2 All-Star Tournament that played June 28 to July 6. The previous week, the Connie Mack 16-under team, of which many athletes were ages 13 to 14, finished 8-12 against teams with much older and experienced athletes. Now, it’s all-star manager Don Trumble who is looking ahead. “Boulder City Little League is a small league compared to others,” Trumble said. “We are historically doing well if we win one of our four guaranteed all-star games. The all-stars practiced for only two weeks together before the tournament. A few of the top performers for the tournament were Scotty Bahde and Blaze Trumble. Bahde batted .588 and had an on-base percentage of .681 while also leading the team as a pitcher. Trumble, who also pitched well, batted a team-leading .684 for the tournament and had an on-base percentage of .714. Joey Camps batted .466, while Matthew Felsenfeld batted .400 and Dustin Landerman batted .384. The BC All-Stars defeated Legacy 13-7 on June 28 and defeated Green Valley 15-8 a day later. After a tough 8-7 loss to Paseo Verde Green on July 2, the All-Stars defeated Silverado West 10-0 on July 3. In the July 6 semifinal, the All-Stars faced the No. 1 team in the tournament, Paseo Verde Gold. Bahde pitched an excellent game and the All-Stars were leading 4-3 heading into the fifth inning. But they lost 9-4. Also pitching well were Camps and Joe Giunta. Bahde got his first career out-of-the-park home run against Legacy, while Trumble got his second against Green Valley. “All of the boys really came together as a team,” Trumble said. “Some of the more experienced players took on leadership roles, but the rest of the team really stepped up and played hard.